She speaks with the conviction of a woman who knows what she is talking about—because she lived it. The name of her non-profit, Glitch, refers to the unintended negative consequences that can come with internet communications (more on that in a minute) but it’s also an appropriate label for the way the organisation was founded, which she describes as an accident. Elected as Newham’s youngest Councillor at 23 years old, Seyi Akiwowo (Shay-ee Aki-wo-wo) was a trail-blazer for millennials, minorities and women alike. Although her status as a young black female made her stand out amongst her more traditional 50-something white male colleagues, she received a largely welcoming reception and strove to be an inclusive role model for marginalised communities. But Seyi’s Strasbourg speech was soon met with hate speech. In the days that followed, Seyi received a flood of death threats and other online abuse primarily from members of neo-nazi groups. This came less than a year after Member of Parliament Jo Cox was assassinated in broad daylight by an alt-right extremist, reminding the world that not all threats are empty. Even with the support afforded to her by her public office, social media platforms essentially ignored Seyi, her friends’ and her colleagues’ reports of abuse. The local police department was having a similarly difficult time filing all the onerous paperwork required in such cases. In the meantime, the abuse continued. Something had to change. So Seyi took action. Seyi went to work educating herself and others on the prevalence and impact of online abuse. Globally, women are 27 times more likely to be harassed online, and an estimated 5.43 million young people in the UK have experienced cyberbullying. Seyi felt a responsibility to use her public platform to end online abuse, and Glitch was born. At the heart of the organisation’s message is the idea of digital citizenship. It’s not just about not being a jerk online, but actually exercising the full rights and responsibilities one would have as a member of any modern egalitarian community. Just as you might pick up litter in your neighbourhood or volunteer with a local civil society group, so too are we responsible for maintaining a clean and safe online environment. Just as we have freedoms (e.g., freedom of speech) protected under the law in the public sphere, these same rights extend to the internet. Digital Citizenship rests on the notion that as more people exhibit positive behaviour online, it will inspire others to do the same and foster more meaningful engagement based on mutual respect. 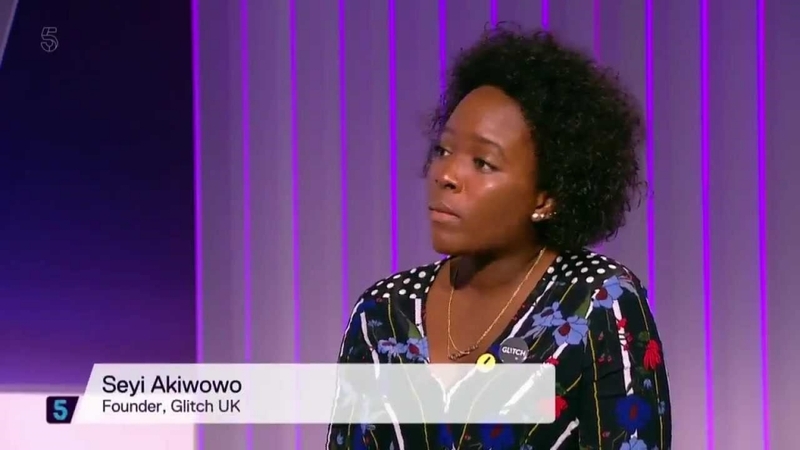 Since its founding in 2017, Glitch has made incredible strides towards achieving its goal through educating more than 3,500 young people on digital citizenship and 50 women in public life on digital resilience, advocating for the UK Parliament to ringfence a portion of the proposed “tech tax” to help make the internet safe for all and presenting at the 38th UN Human Rights Council on Online Violence Against Women. In her role as Founder and Executive Director of Glitch, Seyi recently returned to the LSE, her alma mater, to share some of her experiences and lessons-learned leading an advocacy campaign with current students. Don’t let the group that your campaign is targeting set the agenda and don’t let them hold the purse. As an activist, other organizations might want to partner with you and offer to sponsor your campaigns. Having someone else foot the bill for your latest initiative may sound like a win-win, no? “No, no, no,” Seyi cautioned. When it comes to budget, consider whether to welcome external donors. As well-intentioned as they may be, external agencies have their own agenda and may try to change your message. #NoFilter doesn’t only apply to photos. Form alliances with like-minded groups and individuals to create value. Other alliances with women’s and children’s groups such as the Centenary Action Group and Feminist Internet have provided Glitch with access to powerful civil society networks and decision-makers that it might not have had otherwise (for example, groups that may hold similar core values but differing political views). Speak the same language as your audience. Although Seyi is unreservedly left-leaning on the political spectrum, she recognises the value of collaborating with representatives on the other side of the aisle particularly given the UK’s current political climate. Meeting up with a Tory Party MP? Why not wear a non-threatening shade of blue? Phrases like “digital economy” and “internet safety” can be music to the ears of a potential right-wing ally whist still getting your agenda across. Because a safe internet benefits everyone, no matter his or her views. Prior to Seyi’s seminar I was familiar with the concept of online abuse, but I honestly hadn’t thought much about my personal power to stop it. As she spoke, I was struck by her passion and ability to tackle such a seemingly intangible and untameable issue. Seyi’s grit reminded me that although change can seem impossible, that’s not a reason not to try. Whether you’re compelled by Glitch’s mission and are ready to assume your place as a digital citizen or you’re inspired to take on your own cause like Seyi did, I’d encourage you to check out Glitch’s website. There, you can learn more about the organisation’s three pillars of awareness, advocacy and action, sign up to receive a Fix The Glitch Toolkit to host your own conversation on ending online abuse or take the pledge to “never to commit, condone, or remain silent about online violence against women + girls”. Krista Kartson (@KartsOnMyMind) is an MSc Development Management candidate at the LSE and holds a BA in International Studies from American University in Washington, DC. Krista has eight years of professional experience in international relief & development, and most recently designed programmes for displaced persons and returnees in Iraq. Her research interests include the political economy, land tenure policy and post-conflict stabilisation in the Middle East.